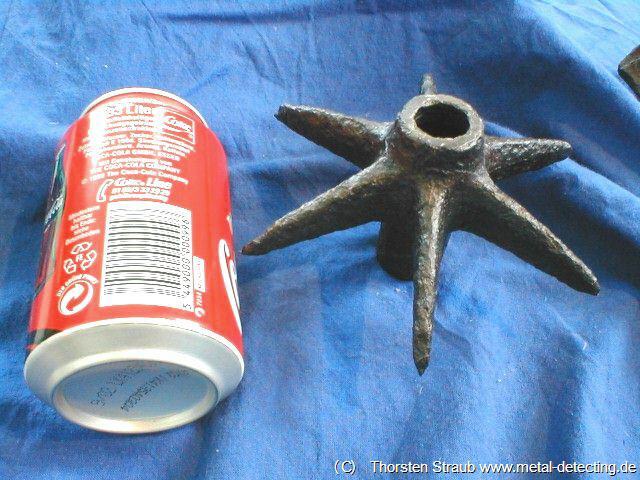 This object was part of an medieval or early modern lock. It comprises three iron sheets still visible. The space between them is now filled with corrosion. The item was inserted in a tube shaped counter part. The outer sheets, under spring tension, would lock. To remove the item it was necessary to press the two outer sheets together using a sort of key. A group of medieval and early modern iron items. Among the both horse shoes the one below is older. It is a so called wavy rim horseshoe dating from ca. AD 1000 to 1400. 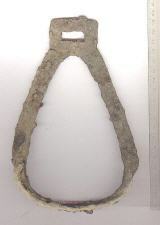 This is the oldest type of the “U” shaped horseshoes. When the holes were created the excess iron caused the rim to get a wavy shape. Later blacksmiths learned how to avoid this. The object to the right of the wavy rim horseshoe is an axis nail. It was hammered into a hole in the axis so the wheel would not jump off. Among the knives several are of the “hunchback” type or have a groove parallel to their back. These are from late antiquity or medieval times. (AD 500-1500). The spur in the top left corner is slightly younger. It is difficult to date this stirrup. The upper region looks rather modern, even industrial. In stark contrast the lower curved part looks very old. The only stirrups I found in literature with a curved standing plate were among the oldest listed and dated to ca. 800 AD. Very soon the blacksmiths found out how to fabricate an even standing plate. Until literature research yields more information I date it pre 1500. Socket arrow head ca. AD 1000. Arrow heads with sockets are slightly younger (AD 1000) than those with tangs (AD 800). By 1500 they were replaced by crossbow bolts in Central Europe. "Leaf" arrow head 9. to 10. century. Like all broad projectiles it was used primarily for hunting rather than armor piercing applications. The broad form caused a lot of damage tissue. Ca. AD 1400 to 1500. A mace is a beating weapon. Attached to a wooden or metal stick it was very powerful. Maces were in use from antiquity to early modern times. As mainstream armament they went out of use in late medieval times. Mace heads come in all forms and various materials. Unusual about this mace are the pointed wings as they tended to get stuck in the enemy. A very beautiful and delicate piece. Small copper alloy appendix attached to handle. Swamp iron is a intermediate product during pre 1500 iron ore processing. The furnaces of that period were unable to reach the high melting point of iron so the iron was created as a solid but porous pieces. These are called “sponge iron” because they contain so many cavities. As the next step the blacksmith re-heated the sponge iron and forged into solid blocks. 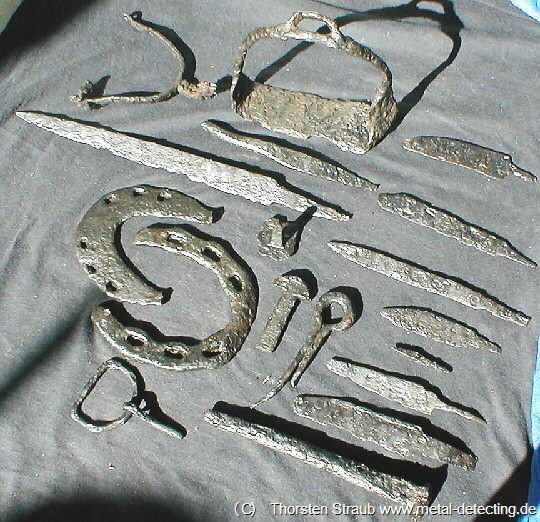 The pieces shown here were found in areas that produced Roman and medieval finds. The largest weighs slightly more than 1 kg. It is difficult to understand why those who operated the furnace did not take it. 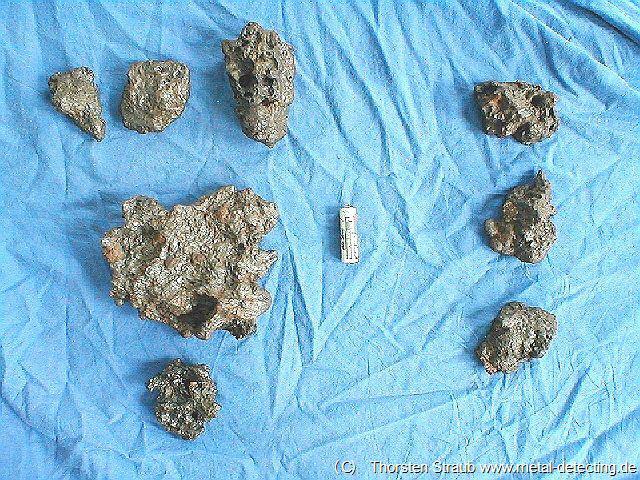 For the full search story, see medieval raw iron production site. Having a loop on the backside, these are the oldest buttons. These very fragile objects date to the 14. century. Contemporary to the cathedrals, they belong to the oldest known type of buttons. 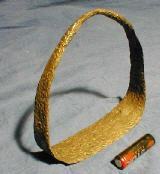 Prior to this brooches or fibulas were used. The buttons have intact loops on their backside.